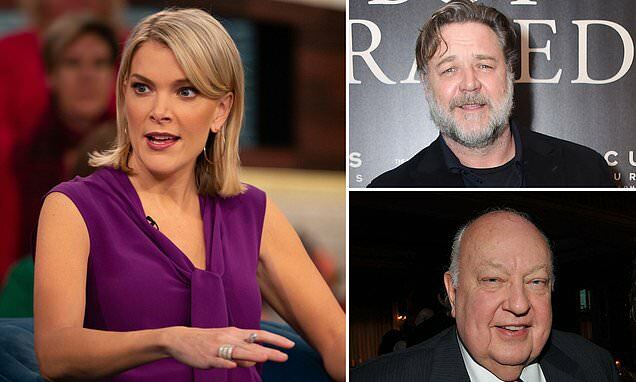 As Megyn Kelly is making her pricey exit out of NBC, her character in Showtime's latest miniseries about Roger Ailes is also getting the boot. The Hollywood Reporter revealed that the untitled series, which has yet to begin production, has cut the character of the embattled TV host from the script about the downfall of the disgraced Fox News chief. Series co-writer Gabriel Sherman, who also wrote the book The Loudest Voice in the Room of which the series is based, said that Kelly's removal is not a major adjustment as she played a small role in the eight-episode series. The axing comes a week after Kelly was ousted from the Today show over her controversial comments defending blackface on her hour of the show. 'Megyn Kelly was a peripheral participant in Ailes' downfall,' Sherman told THR. 'It was Gretchen Carlson and her lawyer Nancy Erika Smith who drove the events that led to Ailes' ouster. Sherman said Kelly's character would have only appeared in a few scenes of the Showtime series.